"We are still ironing out the funding details, but we are pleased to be able to support the continued exploration of Mercury," said NASA MESSENGER Program Scientist Ed Grayzeck, who made the announcement on November 9 at the 24th meeting of the MESSENGER Science Team in Annapolis, Md. The spacecraft's unprecedented orbital science campaign is providing the first global close-up of Mercury and has revolutionized scientific perceptions of that planet. The extended mission will allow scientists to learn even more about the planet closest to the Sun, says MESSENGER Principal investigator Sean Solomon, of the Carnegie Institution of Washington. "During the extended mission we will spend more time close to the planet than during the primary mission, we'll have a broader range of scientific objectives, and we'll be able to make many more targeted observations with our imaging system and other instruments," says Solomon. "MESSENGER will also be able to view the innermost planet as solar activity continues to increase toward the next maximum in the solar cycle. Mercury's responses to the changes in its environment over that period promise to yield new surprises." 2. How late into Mercury's history did volcanism persist? 5. How does the solar cycle affect Mercury's exosphere and volatile transport? 6. What is the origin of Mercury's energetic electrons? "Advancements in science have at their core the evaluation of hypotheses in the light of new knowledge, sometimes resulting in slight changes in course, and other times resulting in paradigm shifts, opening up entirely new vistas of thought and perception," says MESSENGER Project Scientist Ralph McNutt, of the Johns Hopkins University Applied Physics Laboratory in Laurel, Md. "With the early orbital observations at Mercury we are already seeing the beginnings of such advancements. 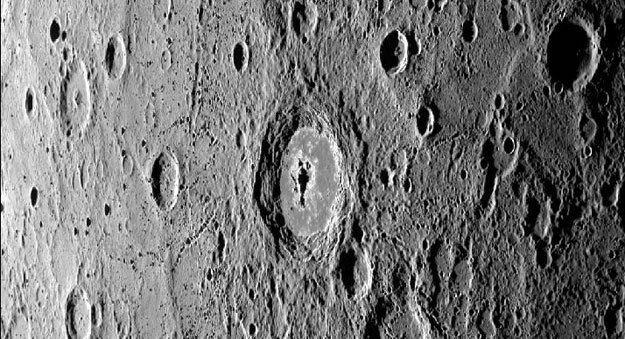 The extended mission guarantees that the best is indeed 'yet to be' on the MESSENGER mission, as this old-world Mercury, seen in a very new light, continues to give up its secrets."